It’s not often that an artist is as adept at working in a miniature scale as on a grand scale, but that is what Chicago-based artist Susan Giles consistently achieves. In her small paper sculptures, the grandiose architecture of Giles’ subject matter is brought down to an intimate size, precise and formal. When her works are enormous, they are just as formal and impeccably crafted, but also surprisingly animated. Here, in “Scenic Overlook,” Giles has recreated the spires of the world’s four highest towers. 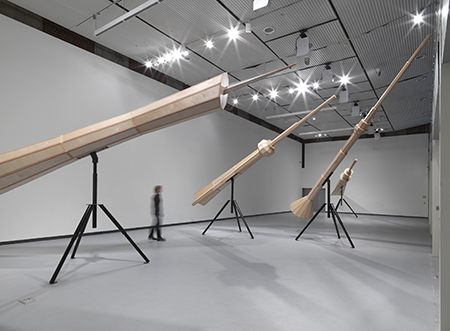 Twenty-five feet in length, tilted and mounted upon steel legs, the spires appear almost personified, communing with one another in the gallery. Though the towers come from all over (Tokyo, Toronto, Moscow and Guangdong, China), here they are united within the same visual lexicon, manipulating the architectural credo we all have in common: bigger is better. From the ground, viewers can gaze up at the sculptures’ apexes as they would at the skyscrapers of the Loop, though Giles has provided an additional vantage point that is far more unusual. Each of the towers is angled towards the catwalk of the two-story gallery, allowing for the viewer to stand at the very place where the peaks converge. The sensation of standing at this concentrated point is simultaneously empowering and unnerving, as if one has finally arrived at a long sought summit only to realize that there are no longer any more heights to conquer.